I can’t remember exactly when it was that I decided that I loved sushi, but it was certainly a life-changing revelation. I am actually very lucky that sushi is relatively healthy otherwise I may be the size of a house by now. I have to confess that I am not the most adventurous sushi fan – I tend to stick to salmon, tuna and prawns, but I am happy with that and do not have the desire to hunt down and sample octopus, eel or whatever other strange things they sometimes use in sushi. I have tried some weird and wonderful sushi int he past but I find that the simple salmon, tuna and prawn combos are without a doubt my favourite. Cost of eating out was really the main reason that I decided to make my own sushi. 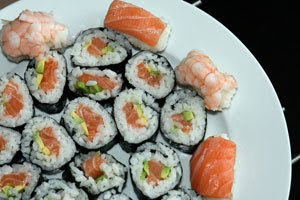 As much as I love it I do not relish the size of the bill that tends to accompany a sushi feast at my nearest yo-sushi. The limited availability of really amazing, good-quality sushi was also a contributing factor. The only sushi place I know of that is local is that Yo-Sushi in the Trafford Centre, and although their sushi is servicable, it is far from the standard I am used to from the Cape Town Fish Market restaurants in my beloved South Africa. 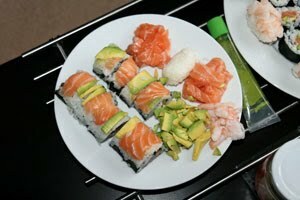 Oh how I miss the avaiability and quality and AFFORDABILITY of South African sushi! I cannot be completely ungrateful however. If it were not for these limitations I would have left it to the highly-skilled experts and never would have attempted to make my own sushi, so I supppose it is a blessing in disguise. And although my sushi may not always be as geometrically perfect and beautiful as that of a professional sushi-chef, its not bad, and it tastes fabulous – so I make no apologies! We buy our sushi-making bits and pieces from Tesco. Despite the fact that I am no huge fan of the supermarket uber-chain, they sell a range of great sushi ingredients from the wasabi paste to the pickled ginger, mirin and rice wine vinegar. All that the amateur (or even the expert) sushi constructor could possibly need. it is also very, very well priced compared to sushi ingredients from any other supermarket and has the most complete range. Sushi rice is easy to make. It is the short-grain rice cooked for the specified time on the packet, and then dressed with mirin, rice wine vinegar, salt and sugar. All the instructions care on the packet and it is really idiot proof. once you have the rice all you need are the seaweed sheets and your chosen filling and a lot of patience while you master the art of rolling. I know that officially I am supposed to use the rolling mat to roll my sushi but I’ve never been able to get on with it, so I just roll by hand, but that is just a personal preference. so, if you haev ever even toyed with the idea of making sushi, I recommend giving it a go. Its fun and delicious and so rewarding!